What are perfluorinated compounds (PFCs)? •Manmade fully fluorinated compounds which are not naturally found in the environment. •Are used in a variety of products such as fire fighting foams, coating additives as a surface-activeagent. •PFOS (perfluorooctane sulfonate) and PFOA (Perfluorooctanoic acid) are the most commonly produced PFCs. •Large amounts of PFCs have been produced during past manufacturing processes and released to the air, soil and water. •PFOA and PFOS are persistent and mobile in the atmosphere and aqueous environments, due to their chemical stability and low volatility. •Animal toxicology studies indicate potential developmental, reproductive and systematic effects. •After oral exposure, PFCs accumulate and adsorb in the serum, kidney, and liver. •Resistant to direct oxidation, photolytic degradation, biodegradation and air stripping/ vapor extraction, making their removal difficult. What is the EPA’s stance? •PFOS and PFOA are on the EPA’s Contaminant Candidate List 4 (CCL 4). •The EPA has taken steps to further investigate PFOAs and related chemicals as well as to reduce their emissions and use in products. •Granular activated carbon (GAC) filters have been recognized as effective technologies for reducing perfluorinated compounds from water. •Incineration of any concentrated PFC waste is required for complete destruction of PFOS and PFOA. Spent activated carbon containing adsorbed species can be thermally reactivated , destroying the adsorbed contaminants and allowing the activated carbon to be recycled and reused. 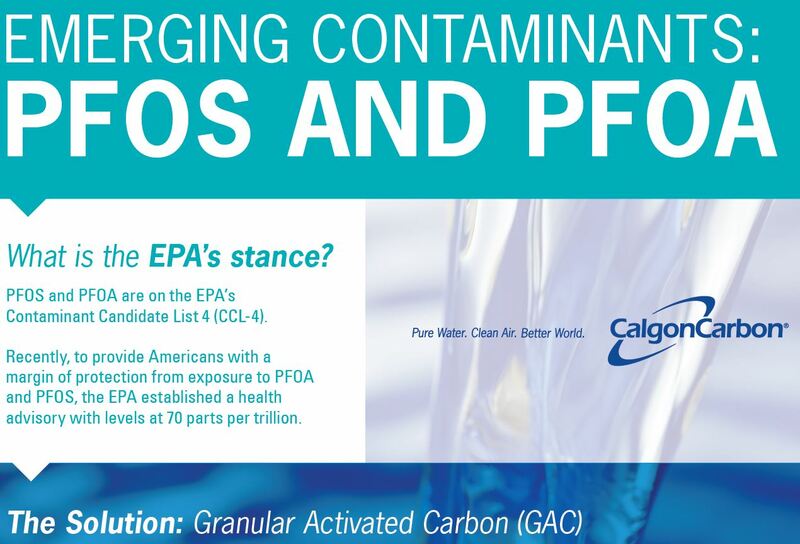 •Recent Accelerated Column Tests (ACTs) of Calgon Carbon type Filtrasorb 400 and Filtrasorb 600virgin GAC shows successful removal of perfluorinated compounds including Perfluorobutanoic Acid (PFBA), Perfluoropentanoic Acid (PFPA), Perfluorohexanoic Acid (PFHxA), Perfluoroheptanoic Acid (PFHtA), Perfluorooctanoic Acid (PFOA), Perfluorodeconaoic Acid (PFDA). •The strong fluorine-carbon bond and low vapor pres-sure makes PFOA/PFOS resistant to a number of conventional water treatment technologies, including direct oxidation, biodegradation, air stripping, vapor extraction and direct photolysis (UV). •Since each water source contains different combinations and levels of PFCs, as well as TOCs, it is advised that a lab or pilot test (such as an Accelerated Column Test or ACT) be performed on a representative water sample to determine the adsorption zone needed, as well as the estimated carbon exhaustion rate to properly design an activated carbon adsorption system. What can Calgon Carbon do for you? •Provide proven and cost effective solutions with activated carbon adsorption technology that cover a broad range of applications and system sizes. •Temporary and permanent GAC systems that can be rapidly deployed. •Our technical and engineering team can perform laboratory and field tests as needed, and tailor solutions for various application and customer needs. CCC has carbon reactivation sites globally that will thermally destroy the PFCs and enable the reuse of the activated carbon.